Polyethylene is one of the most widely used materials in the world, and the discarded plastic bag has become one of the most potent symbols of human impact on the environment. As worries over the vast scale of waste from this plastic has grown, so has the use of purportedly ‘degradable’ forms of it. However, the environmentally-friendly version of polyethylene might not be so friendly after all, according to a new report in Nature. Adding transition metals such as iron and cobalt can promote the oxidation of the ethylene polymers and claims for the degradability or biodegradability of these materials are widespread on food packaging and plastic bags. But a review published last week in Environmental Science & Technology, notes that there is no evidence that ‘degradable polyethylenes’ are actually all they suggest. Although it is clear that ‘degradable’ plastic bags, for example, will fall apart in the environment, the resulting fragments can persist for a long time, and there are no long-term studies on these pieces. A key issue is that products can be described as biodegradable without reference to the timescale it takes them to fully biodegrade. 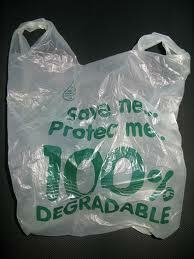 Developing-world countries such as China are also starting to use ‘degradable’ polyethylene, says Albertsson. Indian authorities have taken an interest in the subject, and recently sent a postdoc to work with her. Although some countries are already trying to move to genuinely degradable products based on starch-based polylactide, this is still expensive. And paper-based products may not be a suitable replacement because of the requirement to cut down trees. Noreen Thomas, a materials researcher at Loughborough University, UK, was one of the authors of a 2010 report for the UK Department for Environment, Food and Rural Affairs (DEFRA) on oxo-degradable plastics. These are mainly polyethylene but also include some types of polypropylene. How quickly the plastic will break down into fragments is heavily dependent on heat and light exposure – and hence on the environment the plastic ends up in. The Defra report suggests that oxo-degradable fragments left outside in the United Kingdom would become small fragments over two to five years. The biodegradation of these small fragments then proceeds “very slowly”, it notes. “Our conclusion was there is no benefit to the environment of oxo-degradable plastics,” Thomas told Nature. These plastics should not be composted, as their breakdown fragments will ruin the resulting compost. But neither can such materials be incorporated into traditional plastics recycling as the same additives that encourage the break-up of the original material will degrade the recycled material produced. The report recommended that these plastics should be kept out of conventional plastics recycling in favor of incineration or landfill.